My boyfriend, Chanh and I enjoy spending a lot of time together. We like to play with each others … A LOT. Rumble and tumble, and fighting over stuffed toys. He sometimes thinks that MY teddy bear is his, so we have to argue over it and we play tug-of-war with my teddy. My teddy looks so helpless here, but we were fighting over him. We were kinda of tired by the time Mama was able to snap this photo. Aren’t we so cutes? 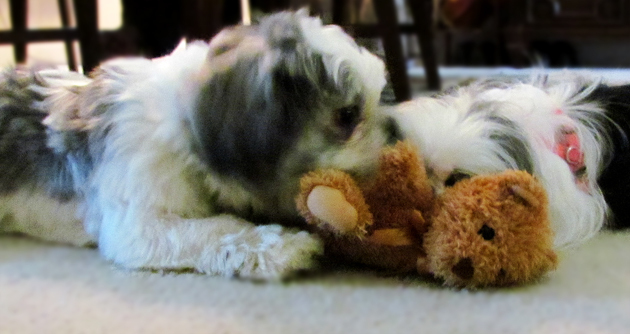 Two shih tzus fighting over a stuffed teddy bear! 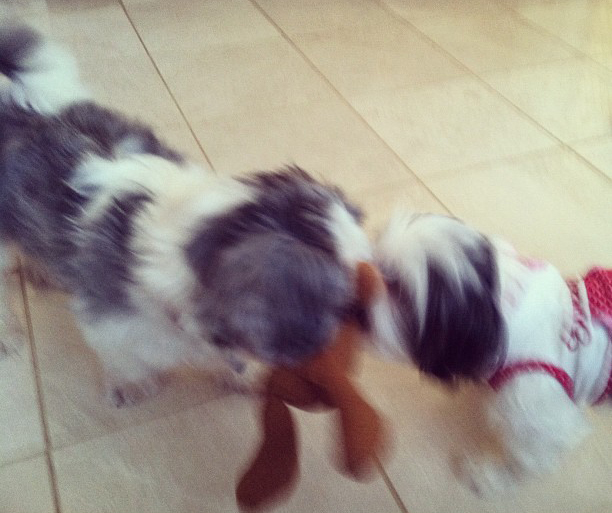 And here’s another photo of the two of us shih tzu playing tug-of-war with another toy. He is a little bigger than me, being a boy shih tzu and all… and I’m smaller wearing my “Sweetie” hoodie. Do you like to play tug-of-war, too?